The WeSubsea hybrid dredging system is a standalone diver/ROV dredging and jetting unit designed for the excavation of stiff and hard clay. Our unique systems are the first to offers high powered dredging and true jetting performance in a compact and easy to use package. 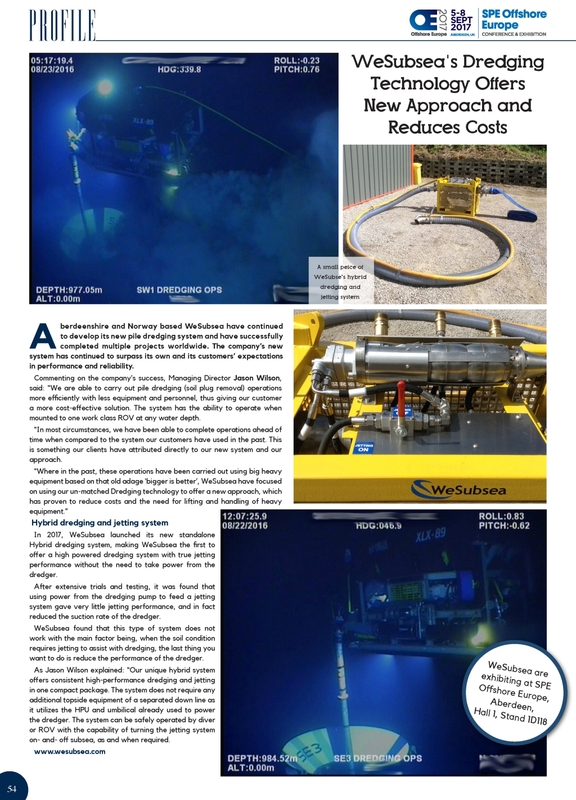 In 2017, WeSubsea launched its new standalone Hybrid dredging system, making WeSubsea the first to offer a high powered dredging system with true jetting performance without the need to take power from the dredger. After extensive trials and testing, it was found that using power from the dredging pump to feed a jetting system gave very little jetting performance, and in fact reduced the suction rate of the dredger. WeSubsea found that this type of system does not work with the main factor being, when the soil condition requires jetting to assist with dredging, the last thing you want to do is reduce the performance of the dredger. As Jason Wilson explained: “Our unique hybrid system offers consistent high-performance dredging and jetting in one compact package. The system does not require any additional topside equipment of a separated down line as it utilizes the HPU and umbilical already used to power the dredger. The system can be safely operated by diver ig ROV with the capability of turning the jetting system on- and- off subsea, as and when required.